Unpacking once and being able to experience multiple ports of calls by simply stepping off the ship was wonderful. The food overall was delicious and we had many choices of cuisine and restaurants. . It was fun to taste the local cuisine at lunch and dinner in each port of call. The guides were so knowledgeable and having the Port talks and Q&As helped tremendously. It enabled the experience of the historical sites to be all we hoped they would be. The Cruise Director gave us little tops for each stop. 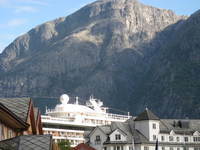 My favorite spot Eidfjord,Norway, was beyond spectacular as we viewed it from our balcony at sunrise. 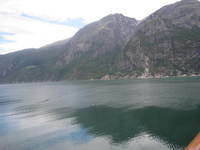 It had been a life long dream to see the Fjords and it surpassed all of my expectations.The most wonderful part overall was the total relaxation on this beautiful luxurious ship. There was nothing you could want for, from the throw blankets everywhere to the popcorn and movies at night to be taken care of at every moment by a very efficient, friendly crew. I appreciated the balcony and the views. We were able to enjoy the spectacular sunrise views of the Fjords from the comfort of our balcony.